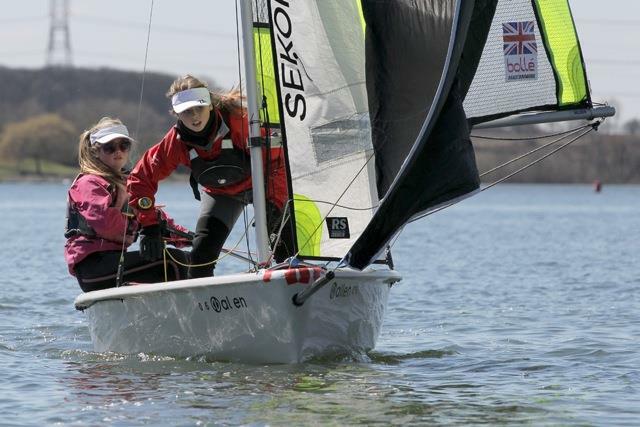 The first RS Feva Grand Prix event of 2013 carried on as 2012 left off – sunny, light, shifty & extremely tricky! Grafham Water SC were the hosts for the 40 boats. The forecast was 3 to 6 knots on the Saturday & this forecast came true to form. After a short postponement the fleet got away in 6 knots of breeze. Two boats were over the line but they came back. Arthur Brown & Niamh Davies lead at the windward mark as the wind dropped to 4 knots on the first leg. The Burnham sailors extended their lead at the leeward gate with Hannah Bristow & Bobby Hewitt in 2nd & Jamie Smith & Piers Nicholls in 3rd. By the 2nd windward mark Will & Matt Taylor had climbed from 5th to 2nd with Hannah & Bobby still in 3rd. The fickle wind then filled in from behind allowing Will & Matt to catch the leaders & after a perfect roll gybe they took the lead & blanketed Arthur & Niamh allowing Hannah & Bobby through to 2nd. The back markers struggled to finish as the wind dropped to 3 knots but the start sequence for race two began as the wind built to 5 knots. A huge left shift as the gun went allowed a few boats to cross the fleet on port whilst many, by the committee boat, struggled to cross the line. It became clear how biased the first leg had become & so race 2 was abandoned. The wind then dissappeared but re-appeared in enough force to attempt another start. The second race restarted but another big left shift & a drop in strength to 2 knots resulted in another abandonment & the fleet was sent home. Sunday dawned sunny & light again, but with a forecast of more wind later. The first start of the day resulted in a General Recall so the next start was on a black flag. The fleet got away in 7 knots of breeze with 3 boats black flagged. Arthur & Niamh again lead the fleet at the windward mark from James Eales & Henry Collings; 3rd Alairic Bates & Matt Walker-Morecroft. As the wind dropped to 5 knots the leader pulled away even further. The race was shortened & won by Arthur & Niamh, whilst Harvey Martin & Will Ward took 2nd from Jamie & Piers who had been black flagged so 3rd went to Courtney Bilbrough & Orla Mitchell. With wind swings of 50 degrees, or more, the race team moved the course & eventually started the sequence for race 3 in 4 knots of breeze. However, the wind dropped and shifted left as gun went allowing one boat to port tack the fleet. Leading at the windward mark was Jamie & Piers; 2nd Sophie Hempsell & Emily Covell; 3rd James and Henry. As the wind constantly shifted & pressure came through from different parts of the course Jamie & Piers did well to hold on to their lead whilst Will & Matt climbed through to take 2nd; in 3rd was Elliott Wells & Jake Todd. The start sequence for race 4 was postponed as another huge left shift came through, but just as race 4 was about to start, another shift resulted in another postponed start at 1 minute to go! Then the breeze came in at last – 10 knots of breeze so the warning signal went up again & finally the fleet got away. With gusts of 15 knots it was Elliott & Jake in the lead; 2nd Arthur and Niamh; 3rd Jamie and Piers. But the wind was still fickle & leading at the 2nd windward mark was Jamie and Piers with Harvey & Will up to 2nd & 3rd Arthur and Niamh. But there was more place changing to come & Harvey & Will lead at the final windward mark from Arthur & Niamh;3rd Jamie and Piers. Finally it was Arthur & Niamh who took the win; 2nd Jamie and Piers; 3rd Harvey & Will. As the wind held, the final race got away swiftly & anyone of 3 boats could take overall honours. Leading at the windward mark was Will & Matt but they were quickly overtaken downwind by Elliott & Jake on the plane; 3rd James & Henry. The 13 – 15 knots of breeze allowed Elliott & Jake to extend their lead at wind ward mark; 2nd Harvey and Will; 3rd Will and Matt positions they held to the finish. This gave the overall win to Will & Matt Taylor from Alton Water Sports Centre; 2nd Arthur Brown & Niamh Davies from Royal Burnham YC/Burnham SC; 3rd Jamie Smith & Piers Nicholls from Hayling Island SC. Congratulations to the Race Team of Peter & Sue Saxton who managed to secure 5 races in the trickiest of conditions.